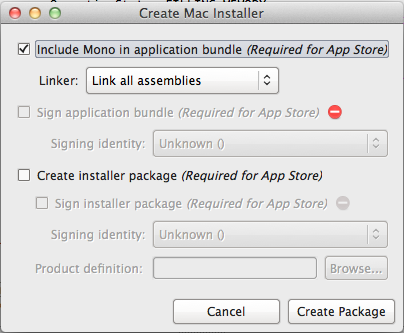 When developing applications with Mono/MonoMac it is very useful to create an installer that bundles Mono with your application. MonoMac includes a utility for creating an installer but unfortunately it is bug ridden and limited. Here are the steps that work for me. Note: make sure you have Xcode installed. Start PackageMaker by going to Spotlight and searching for it. It can also be found in /Developer/Applications/Utilities. 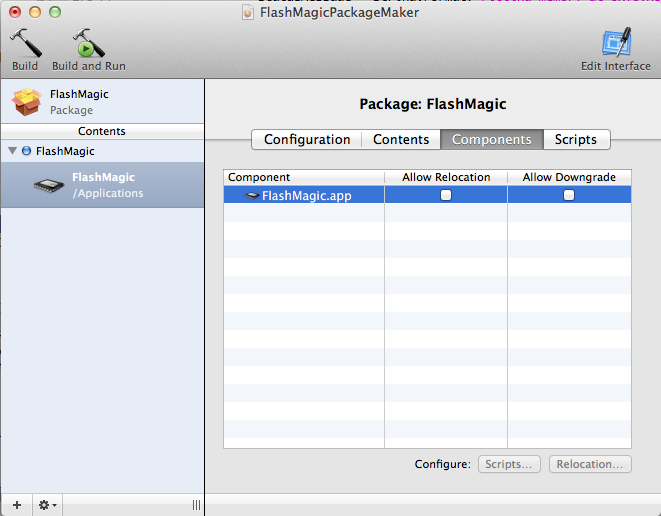 Drag your bundle MyApplication.app to the left hand side of PackageMaker. You may or may not want to uncheck the option to allow relocation. On your development Mac if you don’t uncheck this then the installer will find a version of your application inside your MonoDevelop solution and overwrite it rather than putting it into /Applications. This makes it appear as if the installer didn’t work. On non-development Macs this option allows the application to be overwritten even if the user has moved it after installing an older version. The same can’t be said for MonoMac. The mistake is to equate the static MainClass class as being the same as the WinForms Program class in the example shown.